You can listen to 'Rosalee' here. Earlier this year Chris' younger brother Rich already pleasantly surprised me with a good solo album, Through a crooked sun (click here for the review). Recently Chris Robinson surprised me with a very pleasant album. Of course we know both brothers for circa 21 years as the driving duo behind The Black Crowes. When I'm honest, I never liked their band as much as I do these two albums. Too much a rip off of The Faces, which band could never stand in the shadow of its heroes, The Rolling Stones. So, heaving said this and undoubtedly having made many new friends, lets talk about Big moon ritual. Chris Robinson Brotherhood has released an album that holds all the best from the 70s, I'd say. Slowly fleshed out songs, mixed with psychedelia, experiment, Americana/Southern rock, Traffic and west coast pop. The pop element makes sure that whichever bend in the song the band explores, the song is held together by the force and intention behind it. 'Rosalee' plays out for over 8 minutes, but remains interesting for the whole duration. What makes Big moon ritual so interesting, is that the album sounds very warm. The electric piano, played by The Black Crowes' keyboardist Adam MacDougall, constitutes a main part of the sound of this album. Neil Casal's, of Ryan Adams fame, guitar playing gives the album a Mick Taylor flavour, as in the more country songs of 'Exile on Main Street'. Not that Big moon ritual copies the greatest of Stones album, by far not. It is its own, more American. 'Star or stone' evolves in a slowly expanding, epic guitar solo, where the chord progression is slowly explored, at ease, with grace and loads of beauty. The songs on Big moon ritual are so smooth. The way they're played is like a warm bath. Luxurious and soothing. Listening to them I feel enveloped, become one with the music. Chris Robinson's ragged voice is soothed by the harmonies of the band and the general sound. The intro to 'Tomorrow blues', with the out-dated synthesizer sound, is just a set up to another great melody and song. Steve Winwood is a definite influence on this album. I already mentioned Traffic, but 'Reflections on a broken mirror' almost could have slipped unnoticed onto 'Arc of a diver'. It's slightly to bluesy for that, but the keyboard solo? 100%. The Black Crowes are somewhere in this album. Especially in Chris Robinson's voice obviously, but the music is so much more relaxed. (I admit that I never heard an album passed 'Amorica', which was enough for me.) Partly helped by Neal Casal, Robinson has written seven songs that are more than worthwhile listening. Every time I hear another hidden treasure or reference in the music come by. In short, Big moon ritual is a seven song long anachronism. The longer version I've just explained to you. Not many albums in a 70s like experimental US southern rock style, come as good as this one. 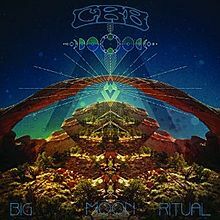 Chris Robinson Brotherhood has managed to keep the song going, where this was often forgotten by its predecessors. The result? A cd that has been in my cd player many a time and loud at times too.